Zone 2 rail station in Bermondsey. Train services heading into London terminate at London Bridge Station. This is a very small station with no facilities to speak of, though there are a few shops and cafes and things nearby on Ilderton Road. There are no ticket barriers to entrance/exit (as of June 2008). 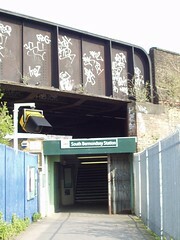 The actual entrance to the station is via a lengthy footpath, which can be reached from either Ilderton Road or Rotherhithe New Road. Last edited 2013-10-11 10:34:06 (version 9; diff). List all versions. Page last edited 2013-10-11 10:34:06 (version 9).